If you have always wished to play the roulette in an authentic casino, but you never had the chance, now you can finally do it by playing NoZero roulette 3D. The game doesn\'t have the usual zero numbers on the wheel, which are very well known for the fact that the house gets its advantage from there. 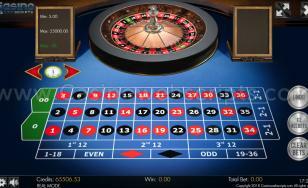 Try your luck and never give up because this roulette game is only meant to keep players engaged. The excitement, the thought of winning great cash, and above all the engaging experience will certainly make you adore the NoZero Roulette 3D. 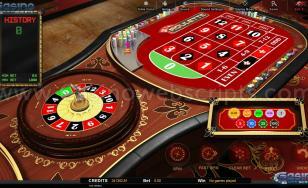 The game of Roulette is played with a small ball that spins round on a wheel that has 36 numbered slots. Once the wheel stops spinning the ball will come to rest within one of these slots. 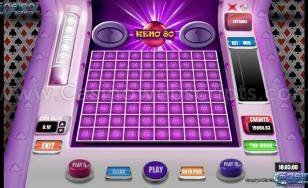 The objective of the game is to predict correctly the slot in which the ball will land. If the player predicts the right number then they win a payoff on their bet. The value of the payoff depends on the how the bet was placed. By clicking on the SETTINGS icon from the bottom left corner of your screen, you will open the Settings popup. 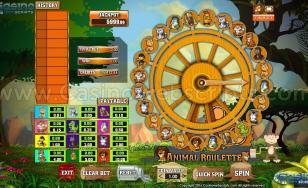 Here you can adjust sound functionality, change table color and enable FAST PLAY and ONE CLICK BET. 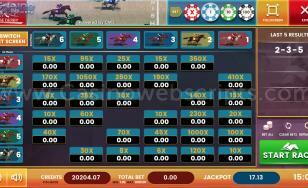 One Click Bet - if checked, the player can place chips on the betting board with only 1 click. 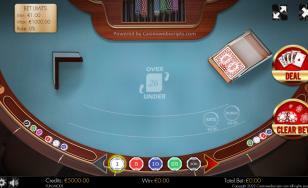 If unchecked, the player can place chips on the betting board with 2 clicks: first he must click to select the bet area and then he must click again to place the chips. Your chips are stacked by their denomination (EG: 1 CREDIT, 5 CREDITS, 25 CREDITS, 100 CREDITS, 500 CREDITS), on the right of the roulette wheel. To select the amount that you would like to wager on a specific bet area, you must use the up and down arrows from the chip selector area and change the selected chip to the one that displays your desired value. This activates that chip denomination, and then you must place your bet on the table by clicking on the desired BET FIELD. To specify a bet that is not equal to an existing chip denomination then you can click simply on another chip denomination after placing your first chip on the table. E.G. to bet 28 CREDITS, you would first select the "25" chip and place it on to the table one time, and then click on the "1" chip and place it on top of the "25" chip, 3 times. You can also repeat your last bet by simply clicking on the "REBET" button. If you want to clear the bets that you placed on any particular bet area, you can use the X (erase chip). This can be selected by clicking the down arrow from the chip selector area, until the X chip is selected. Depending on where you decide to place your chips, you are able to "cover" (bet on) anywhere from 1 to 18 numbers on a single bet. If you place a wager that is lower than the minimum table bet limit then a pop-up box will appear asking you to adjust your amount. 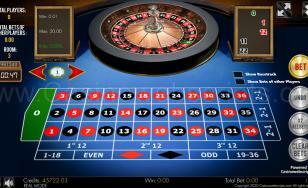 You can then spin the roulette wheel by clicking on the roulette wheel. The history of the previous winning numbers is displayed in a table, which is above the Game Menu. There are three differing colored number within the history table: yellow means that they belong to the black set of numbers, the red means they belong to the red set of number. 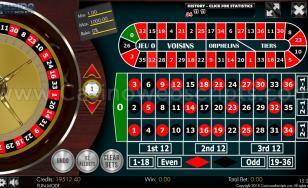 You are able to place nine different kinds of bets onto the Roulette Table. 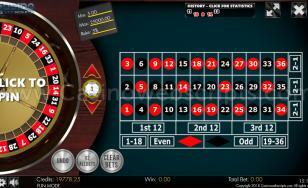 Each type of bet covers a range of numbers on the wheel, and each type has its own payoff rate. The short lines of three numbers each are called rows on the boards, and the longer lines that hold twelve are called columns. The initial six types of bet are all made on the numbered space or on the lines between them, which are called inside bets. The last three types of bet are made on the special boxes below and to the right of the board, and these are called outside bets. Straight Up: The player must place their chips directly on any single number. Split Bet: The player must place their chips on the line between any two numbers. Street Bet: The player must place their chips at the end of any row of numbers. A street bet covers three numbers. Corner Bet: The player must place their chips at the corner where four numbers meet. All four numbers are covered. 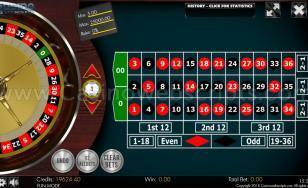 Line Bet: The player must place their chips at the end of two rows at the intersection between them. A line bet then covers all of the numbers in either row, for a total of six. Column Bet: Placing a chip in one of the boxes marked "2 to 1" at the end of the columns covers all of the the numbers in that column, a total of twelve. Dozen Bet: Placing a chip in one of the three boxes marked "1st 12," "2nd 12," or "3rd 12" covers all of those twelve numbers. A chip placed in one of the six boxes at the bottom of the board covers that half of the board that is described in that box. Each of the boxes covers eighteen numbers. After a spin is completed, the winning number will be noted on the table with a marker. 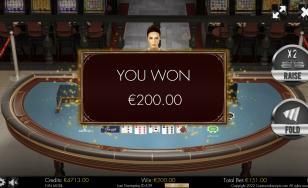 A small amount will be deducted from every win of the player. The value is displayed inside the game, as RAKE, under the min/max board. 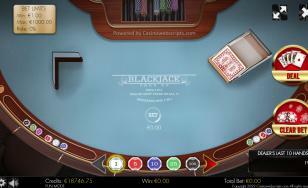 By clicking on the "CLICK HERE FOR STATISTICS" text, located above the betting area, the player will be taken to a new screen which displays advanced statistics of the gameplay history. The page will display the percentage of odd/even/red/black numbers along with the hot and cold numbers. A hot number is a number on which the ball landed most of the times. A cold number is a number on which the ball landed very few times or didn't land at all. The page will also display how many times the ball landed on each number. The statistics are available only in REAL play mode and they are created using only data from the previous REAL play gameplays of the currently logged in player.